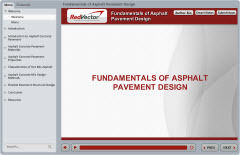 RedVector is proud to release a new course called Fundamentals of Asphalt Pavement Design. This two-hour course is mobile-ready and introduces asphalt pavement systems, as well as asphalt pavement materials and their properties. The characteristics of asphalt concrete are presented in this course, followed by a description of the properties of asphalt pavements. A review of current asphalt concrete mix design methods is also presented. The elements of the structural design of asphalt pavements are discussed in detail. This includes the AASHTO method for determining layer thicknesses. This course will enable pavement engineers, materials engineers as well as materials technicians to gain a better understanding of the fundamentals of the asphalt pavement design process and analysis. Examples and sample calculations are included throughout this course. By the end of this course, you will be able to describe structure of asphalt concrete pavement systems, describe the characteristics of asphalt concrete materials and the properties of asphalt pavements, recognize asphalt pavement construction methods and equipment, identify asphalt pavement distresses and defects, calculate and evaluate asphalt concrete mix volumetrics, describe the process for asphalt mix design methods, recognize asphalt pavement structural design methodologies, and perform design calculations using the AASHTO method to determine layer thicknesses. This RedVector course was authored by Kwabena Ofosu. Dr. Ofosu earned a Master’s degree and PhD, both in Civil Engineering from Florida State University in Tallahassee, Florida and currently teaches Traffic Engineering at Valencia College in Orlando, FL.